The most number of disruptions in the Lok Sabha (lower house) in the history of India’s parliament occurred during the second term of the Congress-led United Progressive Alliance (UPA). In this period (2009-2014), when the Bharatiya Janata Party (BJP) was the main opposition party, 37% of the Lok Sabha’s scheduled work hours were lost to disruptions. The current, 16th Lok Sabha with the BJP-led National Democratic Alliance (NDA) in power, has seen the second highest (16%) loss of working hours. Yet, it managed put in 20% more productive hours than the previous UPA-II government. These findings come from the recent statement of work released by the Lok Sabha and a study of the functioning of the current Lok Sabha term by the non-profit PRS Legislative Research. ‘Scams’ were the most frequent reason for house disruption during the two most recent Lok Sabha sessions, according to an IndiaSpend analysis of Lok Sabha records of session proceedings. The Opposition provides significant checks and balances to the working of a government. Parliamentary democracy works on the basis of consensus reached after discussions on legislative matters. However, the Indian parliament appears to be spending more time dealing with disruptions than completing legislative work, our analysis of Lok Sabha records shows. On average, Lok Sabhas that have completed five-year terms have worked for 2,689 hours. (The Lok Sabha can be dissolved before its full term if the ruling government loses its majority.) The Lok Sabha under UPA-II worked just 1,350 hours--half the average. The current NDA regime logged in 1,615 hours of work--20% more. The first, second and third Lok Sabhas were the most productive and worked for more than 3,500 hours on average, according to PRS analysis. During the fifth Lok Sabha, the Indira Gandhi-led Congress government (1971-1977) imposed a national emergency in 1975 and postponed elections. This extended term logged the most working hours, more than 4,000. In three instances, the Opposition disrupted Prime Minister Narendra Modi’s speech. The first time was in February 2015, during his pre-budget motion of thanks, when the PM had criticised the previous government’s poverty eradication programme, the Mahatma Gandhi National Rural Employment Guarantee Scheme, for its “failure” to build sustainable assets. The second time, during the 2016 winter session, the Prime Minister had alleged that the Opposition favoured black money, and disruption ensued. 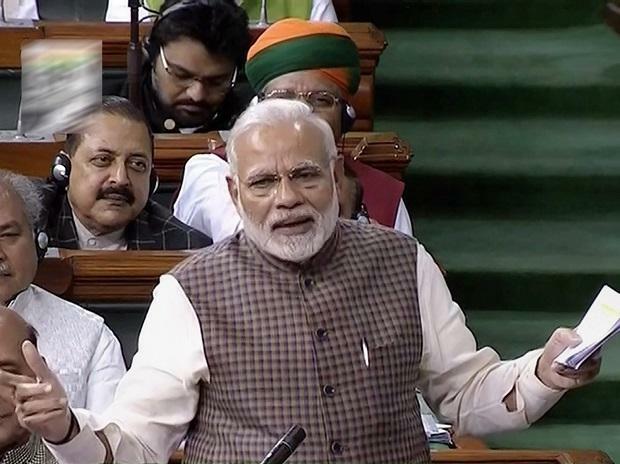 The last disruption was during the 2018 budget session when remarks were “made by the Prime Minister about the former Prime Minister”, Lok Sabha records said. For the present NDA government, the budget session of 2018 (January-April) was the most disrupted and the least productive for both houses of parliament since 2000, according to PRS. The house lost 127 of 161 or 79% of sitting hours. Many Members of Parliament gave notices to move a no-confidence motion against the government during the 2018 budget session. However, the motion was not admitted due to disruptions. The reasons for disruption were varied--“Issue regarding the Andhra Pradesh Reorganization Act, Punjab National Bank scam and Cauvery water, Supreme Court verdict regarding Scheduled Caste and Scheduled Tribes”, as per Lok Sabha records. IndiaSpend further looked into the details of the time lost and the reasons for interruption using a 2018 report of the ministry of parliamentary affairs. As mentioned earlier, the UPA-II government faced the most opposition in the house in the history of India’s parliament. Scams related to financial irregularities in the Commonwealth Games, coal block distribution and 2G spectrum sale; inflation; and the Lokpal Bill (to create an anti-corruption ombudsman) were the top reasons. The most unproductive Lok Sabha session during the UPA-II government’s tenure was also the budget session (February-March 2013). Of the 163 hours available, 146 were lost to issues related to “Price hike in petrol, Plight of Tamils in Sri Lanka, Terrorist attack in Srinagar, Killing of Tamil fishermen by Srilankan (sic) Navy, Interference in the functioning of the CBI. Coalgate Scam, Incursion by Chinese in Ladakh, Bribery for promotion in Railway Board, Law and order situation in UP”, Lok Sabha records said. Delays and adjournments in all the 14 sessions of the previous Lok Sabha during the UPA-II government cost the exchequer an estimated Rs 199.9 crore, ($28 million) an earlier IndiaSpend analysis from 2013 had shown. About 800 hours were lost to disruptions and forced adjournments. Rs 200 crore was the amount allocated to the Ministry of Personnel that year to improve training facilities for bureaucrats.